Traditionally, meatballs were fried in oil in a frying pan. Baking meatballs, however, has several advantages over frying them. 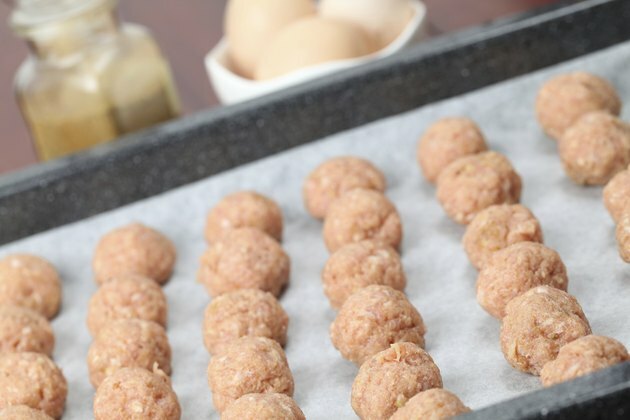 It doesn't require oil, so baked meatballs have a lower fat content than fried. Baked meatballs also take less time and effort; you don't have to watch them on the stove and turn them as they brown. And a baking sheet holds more meatballs than even the largest skillet, so you can make them easily for a crowd. Mix the milk into the dried bread crumbs in the bowl. Let the mixture sit while you finely chop the onions. Add the rest of the ingredients to the bowl. Mix well, using your hands. Spray the baking sheet with nonstick cooking spray. Roll a golf-ball-sized glob of meatloaf mixture back and forth between your palms until you have a sphere. Set it on the baking sheet. Roll the rest of the meatballs, placing them at least 1 inch apart on the sheet. Bake the meatballs for 12 to 15 minutes. If you would like to turn them halfway through the baking process, do so with a spatula. They are rounder and more evenly browned if you turn them, but doing so isn't necessary. Remove the meatballs from the oven when a thermometer inserted in the center of largest one reads 160 degrees Fahrenheit. Remove them carefully from the pan using a spatula. Cool your meatballs immediately in the refrigerator if you want to freeze them or use them later in sauce. Add spices to your meatballs to suit your tastes. Possibilities include onion powered, garlic powder, fresh chopped herbs, nutmeg or chili powder. Make meatballs from turkey, lamb, pork, veal or any combination of ground meats. Make sure you know the appropriate final cooked temperature for the meat you are using. Meatballs that are packed too loosely tend to fall apart, while those packed too tightly tend to be dense and tough. The pressure is less than you would use to pack a snowball but more than you would use for cookie dough. Wash your hands and equipment with hot water and soap before and after working with raw meat. Fry or Oven Cook Meatballs — What's Best?